We all know that Google is a company full of geeky geniuses and they have always had an edge over average person when it come to solving tough tricky questions. Google went a step ahead than their neighbours in the silicon valley by putting up a puzzle in the internet, which when solved will give the actual date and location of the Google I/O 2017. So how did the internet solve this puzzle? Lets find out. The company's Firebase and Google Developers' Twitter account posted the link to a few puzzles for the public to work out and find the dates. The link on the Twitter account takes one to a hidden site. On clicking "GO" in the hidden site, it navigates you to a GitHub website. Within hours, devs who had formed a Discord channel dedicated to the problem had solved the trail of clues which took them via a GitHub repo, where a set of coordinates for a jungle in Brazil are available. The next puzzle takes us to an unlisted YouTube video. The caption in the video shares another set of coordinates. The third puzzle of the game reveals a location in Warsaw Poland and the fourth puzzle reveals a riddle, hidden in a corrupted image which leads to Thailand.Finally when all the pieces of the puzzle are available to an explorer, he or she can solve the same. The names of the countries if assigned to positions on a chessboard and adding and subtracting the value of the letters would provide the name "L IN E THEATRE SHO RE AM P H I". A bit of rearrangement would reveal the name Shoreline Theatre. 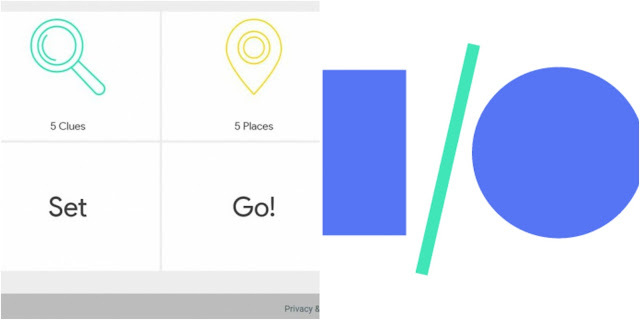 The puzzle revealed that the Google I/O event will take place at Shoreline Amphitheater, just like last year with a bunch of tents around for guests to take a seat. It will again be a three-day affair starting on May 17 and wrapping up on May 19.The whole idea behind this interesting concept has been to lead and entice the audience online to employ a great deal of intuitive estimation and thinking to discover what the puzzle conveys. Google has always been making an impression that defines what they do at google. They always come up with something innovative to convey a statement and this time google has used a puzzle to do so. Let's all buckle up for May 17,18 and 19, because google always brings the party to the town! !